Day two of the SKOHRboard & Stangs League Mock Draft is here! 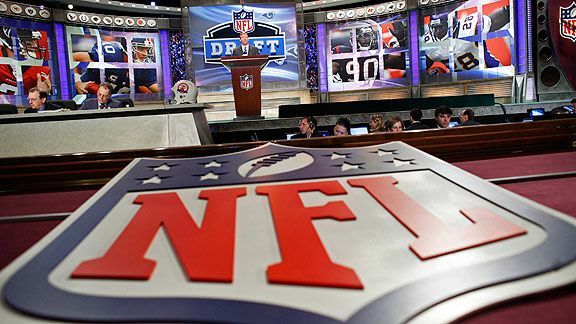 Today we'll be going through the five picks from the Cleveland Browns at number six to the Washington Redskins at number ten. 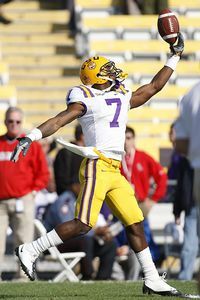 Assuming the Browns stay put, they will take the best player in this draft, Patrick Peterson, with the 6th overall pick. Knowing Mike Holmgren well, he will look to trade backwards a few picks in order to gain a few extra later round picks, while still trying to pick the best player available for their biggest need, which is probably a defensive end who can pressure the QB (something they have lacked/wanted since Courtney Brown). However, if they cannot find a trade partner, they will take Peterson. Peterson offers Cleveland the ability to start right away and be a dominant defensive back. Some have questioned his ability to be a true cover corner the way Darrelle Revis is, but Peterson is a play maker and will try to prove those that question him wrong. Yes, this will be the second consecutive draft where the Browns have taken a Cornerback in the 1st as they took Joe Haden last year. But having two great defensive backs will allow for more exotic blitzing schemes and Cleveland can focus on taking a defensive end/linebacker that would focus on the pass rush in the 2nd round. Peterson is too talented to pass up at this pick. The 49ers had a pretty rough season in 2010. They were the trendy pick to win the NFC West and they ended up starting 0-5 before ultimately scrapping together six wins and costing Samurai Mike Singletary his head coaching job. They have a new coach in Harbaugh and a ton of holes to fill. There is an absolutely glaring hole at QB after the ineptitude displayed by Alex Smith and Troy Smith, and I don't believe even the most dedicated of Fresno State alumni living in the Bay Area is calling for David Carr to take the reins. Despite all the play on tape, however, it sounds like Harbaugh is trying to bring Alex Smith back into the fold for one last go-around. With so many holes to fill on this team and with both Cam Newton and Blaine Gabbert off the board, the 49ers are going to look to take best player available and catch one of the top QBs falling into the 2nd round instead, and will take their much-needed shutdown corner. Amukamara was the 2010 Big 12 Defensive Player of the Year and was team captain of the "Blackshirts." He has good size at 6'0 and 206 pounds, ran a 4.43 forty, is tremendous in run support, and has great awareness in both man and zone coverage. 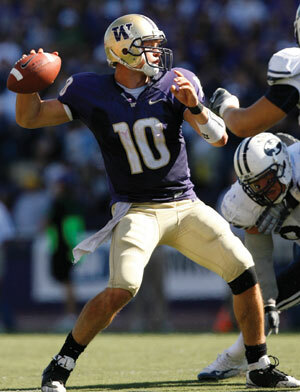 He could be the top in his position in this draft with Peterson. Amukamara had zero interceptions last year, but that is because opposing offenses only dared to throw his way 52 times, completing only 35% (18) of those attempts. San Francisco could certainly make a play at some other dynamic athletes like Quinn from UNC, Fairley from Auburn, and other rush end guys that will litter the first round. This just seemed like too early a spot to grab a QB that might not work out, and I see this team picking up a stop-gap QB in free agency rather than finding one in the first round of the draft. As I said before, there may still be guys like Andy Dalton, Colin Kaepernick, and Christian Ponder waiting to be picked up in the second round, and San Fran would be foolish to let a stud in a need position pass them by. I was very tempted to go a different direction with this pick. Although there are no questions on Fairley’s talent, there are a ton of questions on his motor and passion on every play. He has been known to take plays off and turn it on when he wants. Although he was able to get away with it in college the pros is a whole different animal. One play can mean the difference between a 1-yard gain and an 80-yard TD. People are also concerned that Fairley might have just been a one-year wonder on a very good team. Yes the concerns are great with Fairley but the upside out weighs them all. This guy could be the next Warren Sapp, another guy that a lot of people wrote off because of character concerns and we all know how that turned out. The Titans have stated that they intend to get big, faster, and stronger up the middle and that is exactly what Fairley brings. 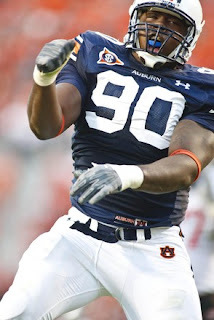 Talent trumps everything on this one and the Titans find Fairley too hard to pass up. Jerry Jones believes this is a team that has all of the offensive weapons needed to make a run to the Super Bowl, and while we strongly considered Wisconsin's Watt as a solution to some key defensive ends headed to free agency, America's Team selects a 20-year old lineman that has drawn comparisons to D'Brickashaw Ferguson. Mr Jones believes that the addition of a Ryan at the D-Coordinator position can make some key differences in the product he gets from his front seven, so it is time to take the top offensive tackle in the draft. Scouts seem to love Smith as a future talent at left tackle, but most of his collegiate experience was played on the right side of the field. This is a very smart pick for the Cowboys, provided they give him some playing time on the right side of the line before moving him to the blind side: let him get acclimated to the size/speed of defensive ends and linebackers before you make him look as fellow alumnus Winston Justice did against the NY Giants. Jones likes to gamble, and if anyone is going to become the first first-round OL selected by Jones, it is more likely to be the raw talent than a more polished player like Castonzo. The Redskins have nailed their last two first round picks with Orakpo and Williams but they still have major needs across the board and the biggest of which is probably at QB. Unfortunately this Draft's top two rated signal callers are already off the board, so while it might make some sense for them to try to trade back and grab another QB later they would run the risk of moving too far to still get one of the guys they want. After Newton and Gabbert, Jake Locker is almost unquestionably the most talented guy out there. Yes, he will need time to develop his game to play at a high level or even competent level in the NFL but so will every other QB in this draft. The thing with Locker is that his ceiling is much higher than any of the other guys available in this class so the Redskins make the prudent move and grab him here. While we also considered Mallett, his intangibles just don't mesh with our organization. We need a guy who is a hard worker and a good person and for some reason Ryan Mallett just doesn't come across that way. After the Haynseworth flap last year, that isn't the kind of character we can afford in a leader on our team, ideally what this QB pick will become. As you might have noticed we also need a top tier WR after badly missing on our Devin Thomas and Malcolm Kelly experiment a few years back. Julio Jones was hard to pass up, however we think that there will be some WRs in later rounds whose value is closer to Julio's than there are any other QBs with value close to Locker's. That is really what this pick came down to. #14 St. Louis - Justin! Cleveland would be feeling pretty good about having Patrick Peterson and Joe Haden patrolling the sidelines. Anything to keep Sheldon Brown off the field! Sheldon Brown is a terrific CB and Cleveland would have to HOPE that Peterson can have a career like Brown's.